The fact is, until we totally forgive, we are all bound up inside, tortured and imprisoned. It is also true that when we forgive, we are freed from the inner prison of self-righteousness, revenge, and the need to gossip. Jesus said the only way to forgive is from the heart (See: Matt. 18:35)! Yes, from the heart, not from the head! In Matthew 18:35 Jesus said that’s how His heavenly Father forgives—it’s heart forgiveness, not head forgiveness! When we forgive in our head and not our heart, the old emotions that stem from our hearts for being wronged keep washing away the thoughts in our minds that tell us it is absolutely right to forgive. But our minds really have very little power to forgive. 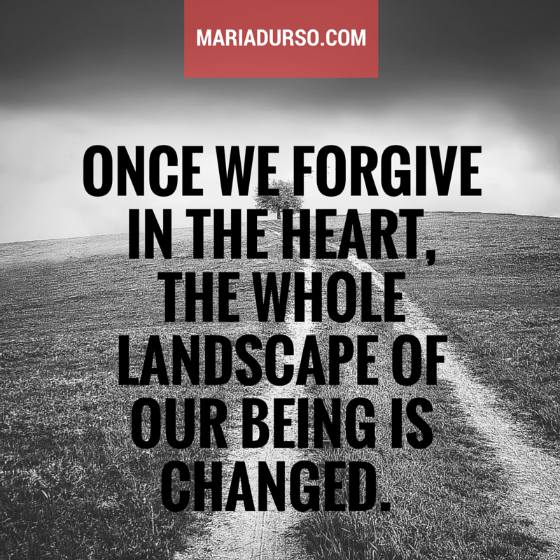 Once we forgive in the heart, the whole landscape of our being is changed. Now the thoughts that creep into our minds have no leg to stand on because the temperature of the heart has been melted by the knowledge that we absolutely in no way, shape, or form deserve to be forgiven or to receive new mercies every single morning. But we receive them anyway because God has forgiven us from His heart. We also know from the Lord’s Prayer that unless we forgive, we won’t be forgiven. Jesus, knowing how deadly holding on to offense is, says in Matthew 5:23–24: “Therefore, if you are offering your gift at the altar and there remember that your brother or sister has something against you, leave your gift there in front of the altar. First go and be reconciled to them; then come and offer your gift” (emphasis added). Notice that He doesn’t say if you have something against your brother, nor does He say it’s OK to forgive when you get the chance. No, He said to leave your gift there in front of the altar and go and be reconciled to your brother immediately—ASAP!— and then come back and offer your gift. Jesus is asking His disciples to take the initiative in the process of reconciliation—whether they were in the wrong or not. Not only are we guardians of our own hearts, but also God wants to make sure that as long as it is possible, we are to keep our brothers’ and sisters’ hearts a dirt-free zone. You truly are your brother’s keeper! That is God’s standard. Question: Do you have the need to forgive in the heart?